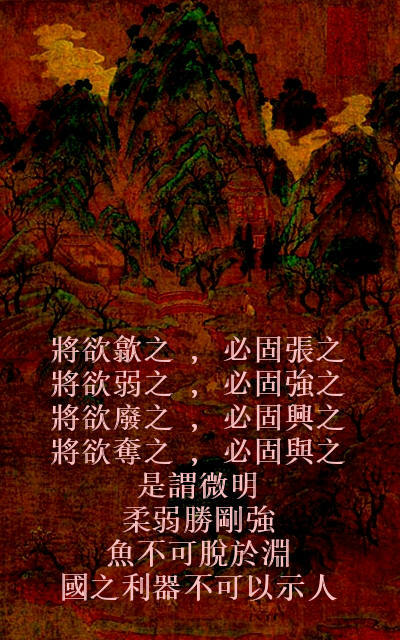 Portion of Daodejing #36: 將欲廢之必固興之. A quick, uncareful, draft, knee-jerk translation... 'Would intend abandon it, will solidify interest it'. All individuals, able to think... able, self-aware... able, self-observe... able, describe... already know what the words imply. Many times in the past, I have written of similar... a person cannot abandon unwanted bad thoughts, if the person is always striving to rid one's self of the unwanted bad thoughts. Recognize the bad... be aware of the bad... then, choose... choose, only good... the bad goes away by itself... a similar idea is spoken of in other ancient Chinese texts... not a new thing, not a thing to be learned from books... a thing, to learn by one's self... it is called, 'thinking'. Legge translation: "When he is going to overthrow another, he will first have raised him up". Goddard translation: "That which shows a tendency to destroy itself must first have been raised up". Suzuki translation: "That which is about to fall has surely been raised". Nature is the standard, of what is correct, and, if a thing is not correct, not in agreement with Nature's way, then the thing is crazy... no quantity of crazy words, are able to supersede Nature's standard. If, an individual does not immediately see the absurdities within the common translations, then, no thinking... and no self-observation... no, self-aware... cannot think. If most people could think, then there would not exist writings of Zhong Yong, nor Da Xue, nor of Daodejing. The writings exist. The writings exist, because, thinking is rare.